So let’s ditch the intimidating thoughts and questions about bulletproof coffee and instead get PUMPED UP! 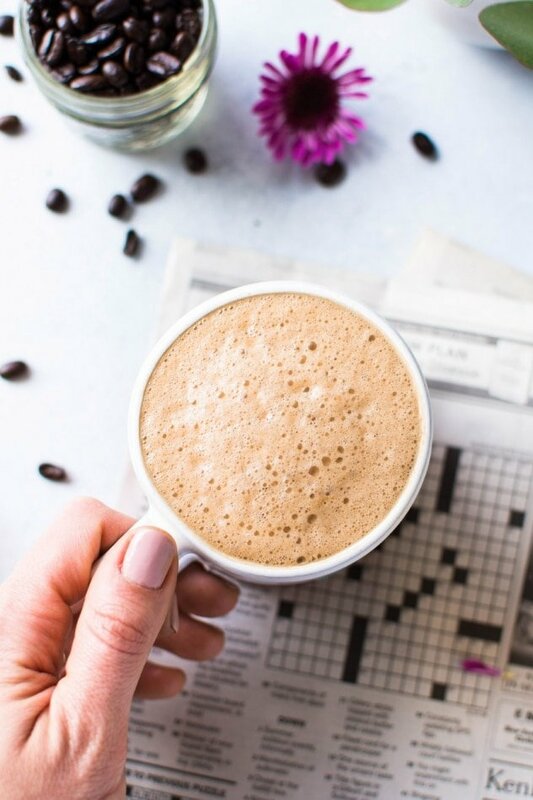 Because I’m about to answer everything you’ve been wondering about bulletproof coffee and teach you how to make it in 3 easy steps. Brew your coffee! Anywhere between 8-12 oz is a good amount – basically a normal sized cup of coffee. 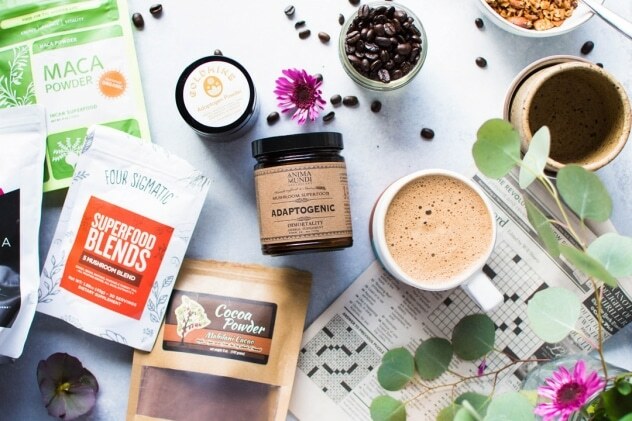 Dave Asprey from Bulletproof Coffee was the first one to put bulletproof (or boosted) coffee on the map in a really big way, and Bulletproof carries a whole branded line of retail products, including coffee beans that are certified clean and toxin free. 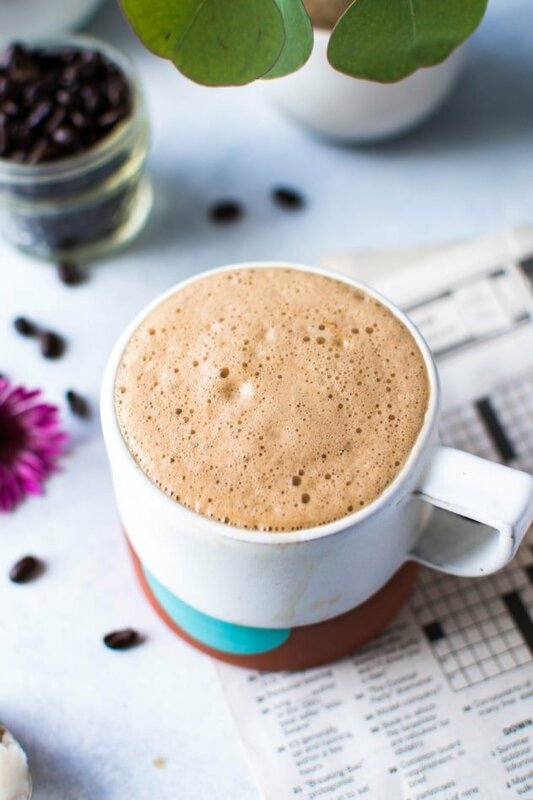 If you’re highly sensitive to toxins you may want to give their beans a try, but it’s not a requirement to making “bulletproof” coffee – you can just start with whatever you usually brew on a daily basis. You have a lot of choices when it comes to healthy fats. I generally opt for a mix of either coconut oil or MCT oil, plus a little bit of ghee (bc it adds a really nice rich texture and flavor! ), but you can totally use whichever of these you have on hand and/or like. cacao butter – you may not be as likely to have this fat in your pantry, but it’s a special one! Blending it into your bulletproof coffee makes it taste like white chocolate. 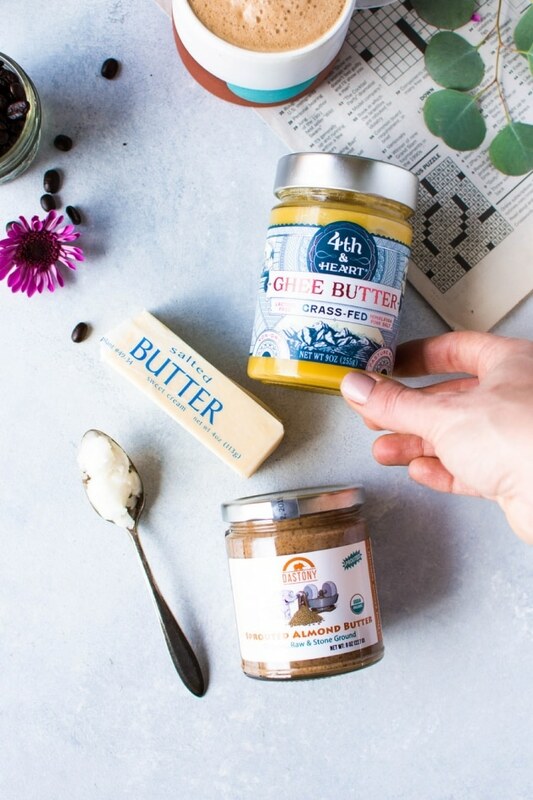 nut butters – best if used in combination with a straight up fat (like coconut oil), but does add an excellent flavor and richness! If you haven’t ever used MCT / Brain octane before start with a small amount, as it can be upsetting to your tummy. 1 teaspoon is a good place to start, and as your body gets used to it you can slowly increase the amount you use. Blend! Add your coffee with your chosen fats to a blender and process until creamy and emulsified. Pour yourself a warm serving of this nourishing caffeinated beverage and ENJOY! bulletproof bonus additions aka a bonus step! 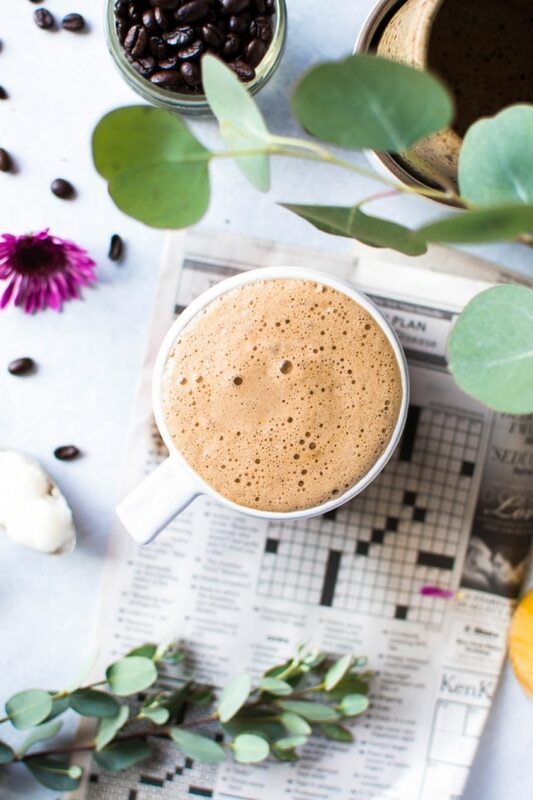 If you want to make your bulletproof coffee a little bit EXTRA, after you’ve chosen your fats it’s time to think about what types of adaptogens, herbs, supplements or flavors you would like to add. Adaptogens are plants or herbs that help regulate your bodies stress response and immunity. Essentially they help your body ADAPT to daily stressors. It’s like the smart version of herbal supplements – they adapt to what your body needs at that moment to regulate your system. They can be a great tool for those managing auto-immune conditions, adrenal fatigue, digestive issues and hormone imbalances. 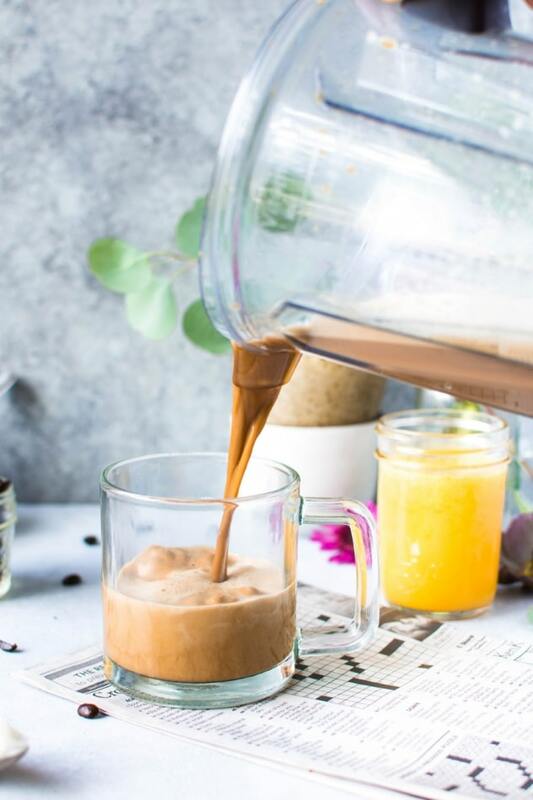 Adding adaptogens / supplements to your bulletproof coffee is an optional step, and what you choose to include is entirely up to you and your preferences. Some of what I’ll share below I add almost every time, and others I cycle through my days depending on how I’m feeling. Here’s a breakdown of the things I usually reach for. Collagen peptides – I almost ALWAYS include a big scoop of these. I find it’s an important supplement in my daily routine to help support nail strength, a healthy gut, healthy hair, skin, and joints. I definitely notice a difference in the health of my nails, skin and digestion whenever I fall off the collagen train. While not a complete protein (and therefore not recommended to take the place of a traditional protein powder), it does boast a nice array of amino acids that basically make up the building blocks of our bodies. Maca powder – Also known as peruvian ginseng, this herbal supplement has been gaining a lot of popularity lately. Well known for it’s ability to help with certain hormonal imbalances and energy levels. Ashwagandha powder – Also known as Indian Ginseng, this well researched herbal supplement has been documented in it’s ability to improve a stress resistance, anxiety and boost low libido. Medicinal mushrooms – This is a broad category of supplements, and includes everything from Chaga to Reishi and Lion’s Mane. Each one has different beneficial properties from boosting immunity to increasing focus and physical performance – if you want to learn more about the many options the Four Sigmatic Blog has a TON of educational resources available. Turmeric – A bright yellow anti-oxidant rich indian spice that is well known for it’s anti-inflammatory and anti-oxidant properties. Works best when paired with just a tiny bit of black pepper. Vanilla extract – a classic flavor enhancer for coffee! While sweetening your bulletproof coffee is totally optional, sometimes it’s nice for a little treat. Especially if you’re adding a fair amount of adaptogens, as they can be rather bitter. 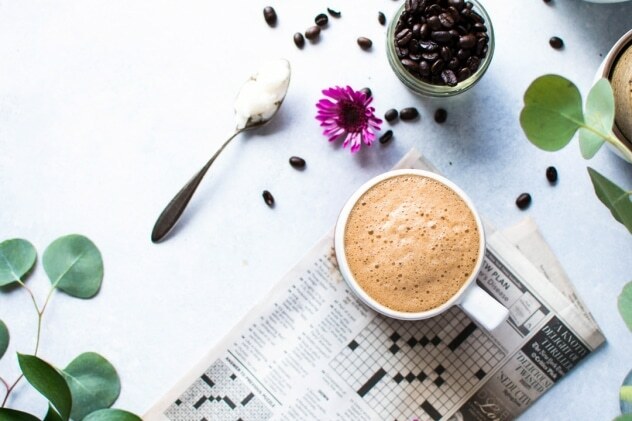 Now that we’ve covered the 3 easy steps, let’s quickly discuss a few FAQ’S about bulletproof coffee and why you should even care about it. At it’s core, bulletproof coffee is an emulsified (blended) beverage of two basic ingredients: coffee and high quality fat. The fat used is typically butter, ghee, coconut oil, or MCT (medium-chain triglyceride) oil. While I don’t encourage replacing a meal with a bulletproof coffee, a creamy cup of this stuff is an excellent way to get more nutrient dense, healthy fats into your diet. For some, it also helps slow down the absorption of caffeine, and minimize the crash that can come along with a big cup of joe. Since it’s high in good-for-you fats and low in carbs it can not only boost your energy levels but also increase your ability to focus and reduce brain fog. If you work out first thing in the morning but don’t really like to eat before exercising, bulletproof coffee is definitely your friend. When I have time to work out in the morning this is my favorite way to start my day. It gives me just enough energy to rock an AM workout without feeling lightheaded because I didn’t eat first. 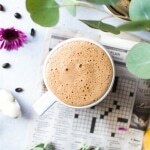 Is bulletproof coffee healthy/good for you? This depends on a broader question – if you generally feel ok consuming caffeine, than mostly likely the answer is yes! Even though the fat in bulletproof coffee can slow the way the body processes caffeine, if you’re highly sensitive to it’s effects adding fat to your coffee may not change that much. (But if you really want to give it a try there’s always decaf! Or you can “bulletproof” or “boost” a matcha latte – or another type of tea, instead!) But if you can do caffeine, and you start with high quality coffee beans and high quality fats then you’re doing it right. 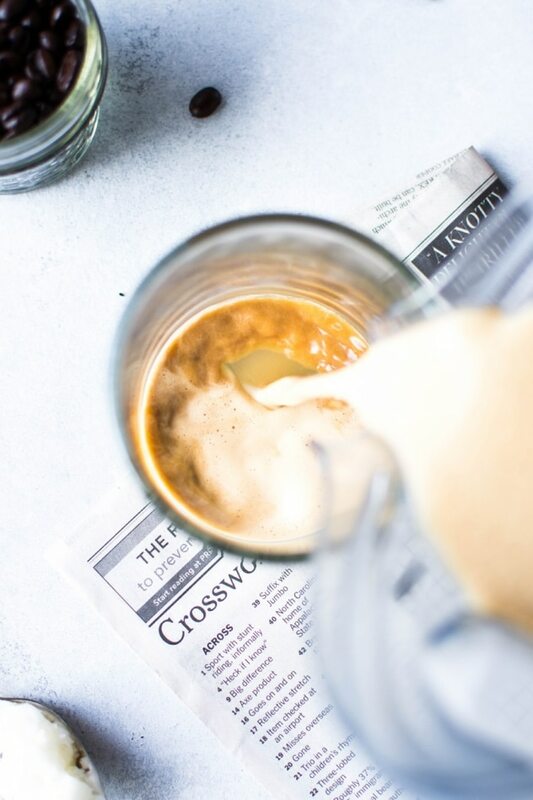 Of course anything in excess isn’t good – one bulletproof coffee a day is a good amount. A lot of times you’ll see “bulletproof” or “boosted coffee” also called “butter coffee”, but it definitely doesn’t have to be made with butter! If you use coconut oil, MCT oil, cacao butter, or coconut butter, it is 100% vegan. Is bulletproof coffee whole30 friendly? Not if you’re following a strict whole30 protocol – as coffee is technically off limits. But if you’re using a coffee substitute, or just drinking decaf during your whole30, and if you leave out any sweeteners or flavor extracts that are made with alcohol, then yes, it would be compliant! Is bulletproof coffee hot or cold? It can be made either hot or cold! I generally drink it hot, but you can make a cold version by using MCT oil. That’s the only fat that will work for a cold bulletproof beverage, since it is liquid at room temperature and will stay emulsified with with your coffee even when it’s cold. If you make it warm you have more options for fat choices. When blended properly, bulletproof coffee tastes kind of like a rich and creamy latte. Of course you can always add different flavors to customize it (which I often do), but it’s also very yummy in it’s super basic form. The biggest mistake you can make when it comes to getting the best flavor out of your bulletproof coffee is not blending it. If you don’t blend it to emulsify the fat with the coffee, you’ll just end up with a cup of coffee with a layer fat on the top. Not the most delicious combo! can you make bulletproof coffee without a blender? I usually use my blender, but if you don’t have one (or don’t feel like dirtying yours up), a great option is a battery operated milk frother. This one from Amazon is only $14.99 and it’s the best one I’ve ever used. Also great for making bulletproof coffee or matcha lattes on the go. It is always packed in my suitcase when I go on trips! From what I understand you are not supposed to make hot drinks in Magic Bullet’s, so using that instead of a blender is not recommended. Only if you add a sweetener. On days where I’m feeling a little extra indulgent, or if I have added a lot of bitter adaptogens to my bulletproof, I will add a little bit of maple syrup, honey, or coconut sugar. But sweeteners can easily be left out of the equation if you want to avoid added sugar / extra carbs. If you’re using bulletproof coffee as a part of a low carb / keto protocol then you definitely want to leave out sweeteners. I’ll include a basic recipe below, but if you are in the mood to upgrade your cup, here’s some ideas! AND THAT’S THAT BABES! If you made it all the way to this point of the post, BRAVO. I know it was a long one, but hopefully you learned something and feel empowered to make your own delicious bulletproof coffee. Comment below if you have any questions or a special recipe / combo that you want to share! Add all ingredients to a blender and blend until creamy and emulsified. Off to blend up a cup right now. Yay! Can’t wait to try your recipes. They sound so so delicious.